Createspace Independent Publishing Platform, 9781548090111, 152pp. In 1961, when the New York Yankees and the St. Louis Cardinals arrived in St. Petersburg, Florida, for spring training, neither team had any idea that a feisty physician was about to turn its world upside down. 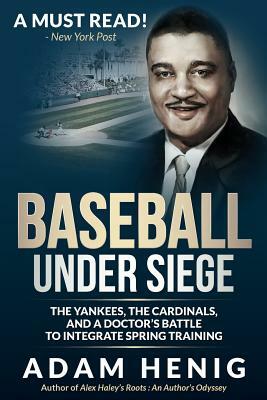 To Major League Baseball, Dr. Ralph Wimbish was just a black homeowner able to house the team's African American ball players, who were segregated from their white teammates-except on the diamond-during spring training. The laws in Florida, like the rest of the South, were dictated by Jim Crow. Major League Baseball had no plans to upend it. Dr. Wimbish had other ideas. Drawing on personal interviews, newspaper accounts, archival documents, and memoirs, Adam Henig has written a story that New York Post sports columnist Mike Vacarro and Tampa Bay Times' Jon Wilson called "a must read " A book for baseball enthusiasts that goes beyond the game, Baseball Under Siege (formerly titled Under One Roof) is an unforgettable tale of a little-known civil rights activist who risked it all to achieve racial justice in his city, in his state, and in America's favorite pastime. Adam Henig is the author of "Alex Haley's Roots: An Author's Odyssey" (2014) and "Baseball Under Siege: The Yankees, the Cardinals, and a Doctor's Battle to Integrate Spring Training" (2016). His next book, "Watergate's Forgotten Hero: Frank Wills, Night Watchman," will be coming soon. His writings have appeared in the San Francisco Book Review, Tulsa Book Review, African American Literature Book Club (AALBC), Medium, The Biographer's Craft and Blogcritics. Adam is an active member of the Biographers International Group. A graduate of California State University, Chico, Adam lives with his family in Gilroy, California. For more information, visit www.adamhenig.com, contact Adam at info@adamhenig.com or find him on Twitter, @adamhenig.